If you are thinking about taking your toddler skiing or snowboarding…. Do it!!! It is so fun to see them try the sport and they honestly look so adorable. This past winter season we have taken our 2 and half year old daughter skiing 3 times. She has been cross country skiing two times and downhill one time. Each time it has been a blast. 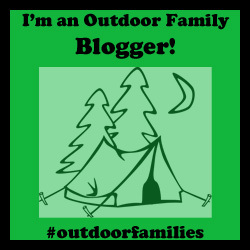 Since my husband is a certified cross country ski instructor (CANSI certified) and I am a physical education teacher, we collectively wrote this post to share 5 tips about introducing and teaching a toddler to cross country ski. By this, I mean you ski first while your toddler is being towed in a ski sled. Watching us from our Chariot sled* made our daughter want to try skiing. In our experience, toddlers generally want to copy everything that their parents do. Watching us ski seemed to ignite a flame in our toddler to want to ski. Although we had to put up with the occasional whining as we pulled her around it was totally worth it. When we finally let her try skiing, she did not want to stop and was excited to be doing what Mom and Dad were doing. Toddlers need exploration time. Let your toddler feel out the skis. Do they fall right away or are they able to stay standing? Can they take a step or two without you or are they too nervous and needs to hold your hand? Encourage your little one constantly (i.e. “You’re doing a great job” and “Wow way to go!”). Assure the little skier that everything is okay and that if they fall down that is okay too. If your toddler is not happy on the skis and not enjoying it, there is no need to push it. Just take some quick pictures and try another day. Even 5 minutes on skis counts when you’re only 2! Encourage your toddler to walk with the skis. Try jumping with skis and then try running. 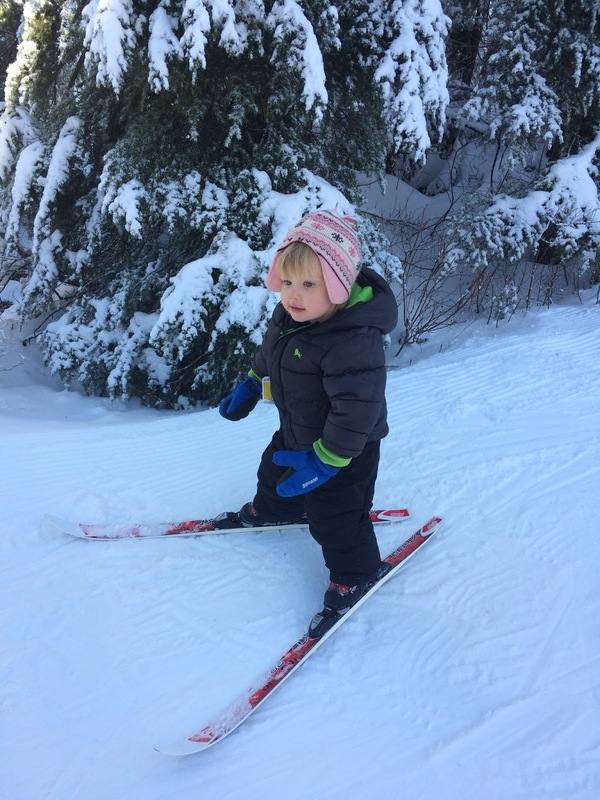 Think of all the moves your toddler can pull off without skis, and encourage him/her to try them with the skis on. Then see if they can push skis instead of walk. Keep a close eye on your toddler and gauge the reaction if your little one has to a fall. Our daughter fell a few times but was still totally stoked to keep skiing. I’m sure that some other day, she might not be so gung-ho. If your little skier is ready to “go it alone”, then let ‘er go. The first time our daughter was on her skis my husband was holding on to her and she was slipping all over. He reluctantly listened to her, and what do you know, she found her balance. That said, if your toddler wants to a hold a hand, then be sure to offer it. The key her is just to let your toddler communicate their needs. We followed our daughter at her pace and helped out as requested. She was the leader and she rose to the occasion. A great tip for when your toddler is doing some downhill on cross country skis is to get them to put their hands on their knees. This helps to get a forward lean and bent knees, because people of all ages have a tendency to lean back when going downhill and end up on their bums. A great way to enforce this is to say ‘Hands on your knees and bend them please’. I honestly loved watching how our daughter tried the downhill parts. She had a look of fierce determination as she slid down these extremely small bits of downhill. If your toddler is starting to feel comfortable in their skis, try playing a game of ‘Catch me’. Take turns chasing each other. This helps encourage your toddler to try different speeds and directions without over thinking their movements. Don’t stop there and get creative! There are lots of other ways to play and have fun while skiing. If you have older kids you could try playing a game of tag or ski handball. The game was one of my favourite parts of skiing with our daughter was when we played a game. The game is what kept our daughter skiing for about 40 minutes and we had a lot of laughs. Now it is time to hit the ski trails. I hope these tips can help you and your little one enjoy skiing together. Let us know how your trip goes! Hi there! Any ski recommendations? Ski places or ski equipment? I’m trying to find small enough skis for my almost 3 yr old, what are you using for your daughter? Thanks! For Cross country skis you should be able to find Fischer or rossignol skis small enough. We bought our uses but we compromised and bought them too big. Our 3 year old has skis that are 110 cm and our 2 year old has size 100 cm. They are too big but that being said our 3 year old managed to ski 5 km last year and picked it right up this year. Our 2 year old could still be in boot skis but since we lost those we decided to invest in a pair that she will use for the next few years. I hope that helps! If you can try to buy boots that fit as that will also make a big difference in their ability to move. This is perfect. I am planning to bring my toddler on a ski trip soon. Thanks! Awesome have so much fun and let me know how it goes! Where ar you planning on going? Where can you rent for a 2.5 year old?? 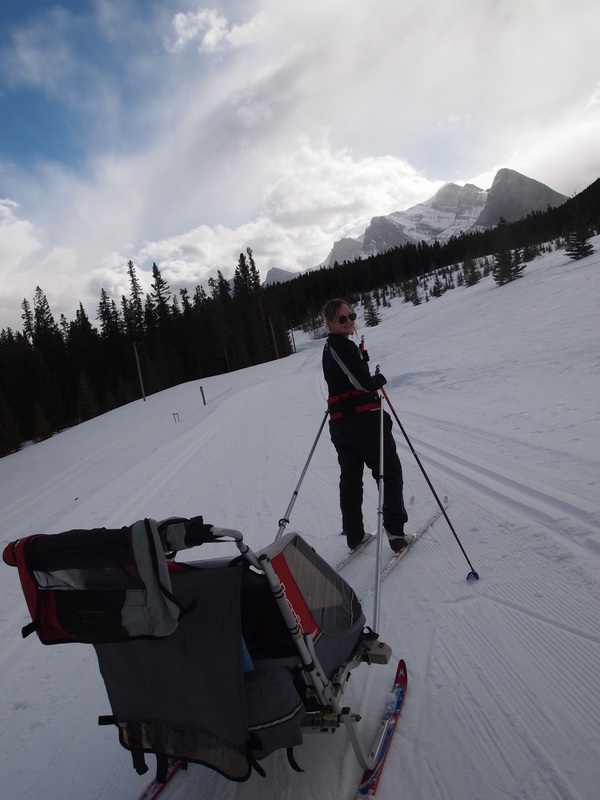 You can rent at the Canmore Nordic Centre in Alberta and at most other cross country resorts. Where are you from? Another option is to purchase the cheaper skis that use only the kids regular winter boots.